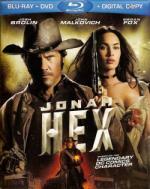 looks like a mix from "Tinker, Taylor, Soldier, Spy", "James Bond" and "Wanted"
Out of the pages of the legendary comic and graphic novels steps Jonah Hex (Josh Brolin), a scarred drifter and bounty hunter of last resort. Jonah's past catches up with him when the U.S. military offers to wipe out the warrants on his head if he hunts and stops dangerous terrorist Quentin Turnbull (John Malkovich). Going into this one I was expecting pretty bad... because when I bought it sight unseen (never even seeing the trailer) I had several people tell me how bad it was and that they were sorry I wasted my money on it. So I was pleasantly surprised that I enjoyed this film. It definitely could be better... but I found it to be above average. Maybe it was because my expectations were low... or maybe because I am not familiar with the source material as I never read the comics. But I found it was worth the time put in to watch it. 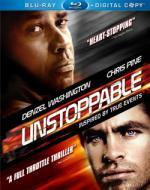 Hang on for the ride of your life as Oscar® Winner Denzel Washington* and Chris Pine (Star Trek) team up for the year's most electrifying action-thriller. A runaway train, transporting deadly, toxic chemicals, is barreling down on Scranton, Pennsylvania, and only two men can stop it: a veteran engineer (Washington) and a young conductor (Pine). Thousands of lives hang in the balance as these ordinary heroes attempt to chase down one million tons of hurtling steel and prevent an epic disaster. Helmed by visionary director Tony Scott (Man On Fire), this story inspired by true events delivers excitement and suspense that are — UNSTOPPABLE ! *Actor, Training Day, 2001; Supporting Actor, Glory, 1989. I enjoyed this film quite a bit. It easily kept my attention through-out. What made this one even better is that it was based on true events... I personally always thought films based on true events made the best stories. I thought the cast did a wonderful job. This is actually the second film I've seen recently with Rosario Dawson... as she was also in Zookeeper. If you never seen this film... I definitely recommend it. Well worth the time put in to watch it. A mysterious event from Earth's past threatens to ignite a war so big that the TRANSFORMERS alone will not be able to save the planet. 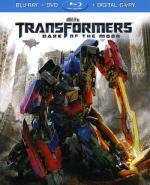 Sam Witwicky (Shia LaBeouf) and the AUTOBOTS™ must fight against the darkness to defend our world from DECEPTICONS'™ all-consuming evil in the smash hit from director Michael Bay and executive producer Steven Spielberg. I enjoyed this one more for mindless action then the storyline. It has been a while since I seen the first two movies to remember the storyline too well... but it seemed to me not to follow the first two as well as it should. But still... all the action is great. At some point I need to watch the three movies back to back though... just to see how well they follow one another.. or if these films are nothing more then eye candy. At this point I feel like it is the later. But if you can leave your brain at the door you should be able to enjoy this film. It's her time. Her place. The wickedly regal Mother of All Vampires is ready again to rule! Aaliyah plays the title role in this stylish shocker based on Anne Rice's The Vampire Chronicles. Stuart Townsend portrays Lestat, the undead antihero previously seen in the movie version of Anne Rice's Interview with the Vampire. This time, Lestat finds acceptance in a tattooed and pierced world. He's a rock star. And his intoxicating Goth-riffed sound rekindles the desires of all-powerful Akasha. As much as I love vampire movies... this one is difficult for me to watch. This was originally a blind buy for me years ago... as it is a vampire movie I had to see it. And I haven't seen it since so I forgot how much I disliked this movie the first time around. The first problem for me was of all the music in this movie. But setting the music aside... it just isn't that great a story. There was some cool scenes with some decent effects. But that seems to be the most I can give this movie. I loved the film Interview with a Vampire... but this follow-up... sorry just couldn't get into it. I so wish I remembered my thoughts on this film before getting the upgrade to blu-ray. But that is ok... this film gets a star just for being a vampire movie alone. Years after walking away from her past as a teenage private eye, Veronica Mars get pulled back to her hometown, an ex-boyfriend with baggage and an unraveling murder mystery. This is the second time I have watched this film since getting the disc. And I must say... as a huge fan of the TV Series...I loved every minute of the film. While I think the movie can hold it's own as a good movie if you never seen the TV Series... it is even better... a must see/must own for any/all fans of the TV series! I can't think of many regulars of the series that didn't at least have a cameo here. But the downside to that is that most the characters has less screen time then you would want them to have. I don't think I really need to say this... but this is one that I highly recommend. Though (while what is there is great) I would have liked to seen a few more extras. I did love the hour long making of featurette! David Duchovny and Gillian Anderson re-team to unravel a bizarre case right out of The X-Files.™ Amidst an eerily deceptive calm, FBI agent Monica Bannan is abducted. 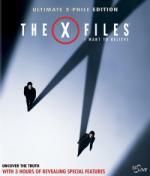 Not only does the search for the missing woman ignite sparks between partners Scully (Anderson) and Mulder (Duchovny), it defies the boundaries of science, the supernatural and the terrifying spaces in between! I have seen in other reviews that this movie is not that much liked compared to the series and first movie. I personally enjoyed it. No... this one doesn't have anything to do with the mythology of the X-Files... but that is something I liked about it. I have always been a bigger fan of the stand alone "freak of the week" episodes. And that is what this movie feels like to me. Sure it could have been better. But I really don't have any complaints. This is the first time I have seen Billy Connolly in many years. The last thing I remember seeing him in was Head of the Class when he took over for Howard Hesseman as the teacher. And wow... did he change. But I would guess so... after all we are talking a good 20 years here. Even though he didn't look familiar at all I knew exactly who he was just from his voice. I can't believe I only have one more film to watch to complete this marathon! Only the letter "L" left.... so as long as nothing goes wrong I will be watching Logan's Rin tomorrow after work! Please no spoiler talk about Logan's Run... I never seen it and don't want anything spoiled! Wow, you've never seen Logan's Run??? I think you will really enjoy it. Watch for Farrah Fawcett...she was lame in this movie, but the rest is pretty good! In the Year of the City 2274, humans live in a vast, bubbled metropolis, where computerized servo-mechanisms provide all needs so everyone can pursue endless hedonism. Endless, that is, until Lastday, when anyone who's 30 must submit to Carousel, a soaring, spinning trip to eternity and supposed rebirth. The screen's first use of laser holography highlights this post-apocalyptic winner of a Special Achievement Academy Award® for Visual Effects. * Michael York plays Logan 5, a Sandman authorized to terminate Runners fleeing Carousel. Logan is almost 30. Catch him if you can. I must say... this was a fun film. I enjoyed it quite a bit. Some of it was a little confusing on the first viewing... but not so bad where it couldn't be followed. Though I must say the character of Box and the scene with him did seem out of place in the movie. But that was not enough to ruin the film. If you never seen this one I definitely recommend checking it out. Well that is it... completed my marathon last night. And did it with a day to spare! Good thing you don't live in Sweden or you would have three more films to watch. 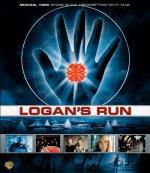 I saw Logan's Run years ago. From what I remember I did like it. I'll have to hunt it up again.